The first time I came to the US I was 12 year old, it was summertime and I stayed one month with a host family in Detroit. There I spent my first 4th of July; apparently we were on a boat watching the fireworks, but the only thing I remember is that I got really sick because I had eaten too much caramel popcorn. When they invited me to a barbecue for Independence Day few weeks ago, I couldn't make up my mind on what to bring. All I could think of were huge colored bins, with overflowing popcorn in white, red and blue. Finally yesterday I had a sudden inspiration and I literally ran to buy all the ingredients. Even if all sorts of accidents happened during the work in progress (I forgot the milk on the stove while making the pastry cream, the electric mixer sized up on me out of spite, the electricity decided to stop working right when I had the tart in the oven), eventually I made it and I was able to get rid of the popcorn ghosts. I always make the tart dough using the recipe from the Simili Sisters (in Italy they are like the rock stars of anything kneaded, two sweet twin ladies that holds baking classes all over Europe). And even this time that I wanted to try the more tender version, which is better as a base for cream and fruit tarts, they did not fail. Sift flour and baking powder on the table. Take butter out of the fridge, cut it in small pieces and rub it with the flour using your fingers, until you get a crumbly dough. Make a dwell in the middle and put sugar, egg and salt. Beat lightly with a fork, then start mixing them with the flour using a spatula. Work the dough until it gets smooth, trying to be as quick as possible so that it won't get warm. Wrap in plastic and let it rest in the fridge for at least two hours before using it. Beat eggs with sugar until they get fluffy, add butter cut in small pieces and keep mixing at high speed. Add flour, almond flour and extract and mix until the cream is smooth. Refrigerate until ready to use it. Warm the milk with the vanilla stick, after opening it in half and scratching out the seeds. Turn off the heat and let it soak for at least half hour. When you are ready to use it, bring the milk back to boiling point. In the meantime, beat yolks with sugar and corn starch until fluffy. Temper the egg mixture with a couple of spoons of hot milk, whisking quickly so that eggs won't cook. Slowly add remaining milk, and keep stirring. Strain the cream back in the pan, and discard any lump. Cook at medium heat and keep stirring until it starts boiling. Keep cooking for another 2 minutes, then turn the heat off and cool it off quickly by putting the pan over a bed of ice. Keep stirring until completely cold, it will take about 5-6 minutes. Cover with plastic and keep it in the fridge until ready to use. When you are ready to bake, roll out the dough and place it in the baking pan, cover with parchment paper and put ceramic weights on top (you can also use some dried beans instead), so that the crust won't rise as much while baking. Bake for 15 minutes at 350, take out the weights and parchment paper and cover the crust shell with a thick layer of frangipane cream. Put back in the oven and bake for about 30 minutes more, until crust and cream turn a nice golden color. 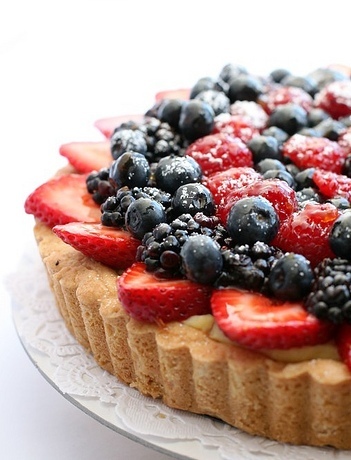 Let it cool completely, then spread a layer of pastry cream and arrange the berries on top, creating circles of alternating colors. In a saucepan, heat some apricot jam with a couple of spoons of water. When the jam is hot, brush it on top of the berries to make them shine. Finally, sprinkle the tart with a little powdered sugar. مؤسسة بخ حشرات بالمدينة المنورة ماسة لمكافحة الحشرات تعتبر من أولى المؤسسات المختصة فى ميدان بخ الحشرات سواء فى البيوت أو فى الحدائق العامة و الحدائق المنزلية و أيضاً فى المؤسسات و المصالح الرسمية و المدارس ونقوم ببخ المخازن والمتاجر والمحلات . فكم من مؤسسة كانت تعانى من إنتشار الصراصير الأمر الذي يكون السبب فى نفور وابتعاد الزبائن و العملاء إلى القدوم إليها ؛ و كم من مدرسة كانت تعانى من إنتشار خلايا النحل بأعداد كبيرة جدا ؛ الشأن الذى كان يشكل خطراً كبيراً على التلاميذ و الطلاب نظراً لتعرضهم المتواصل لخطر اللدغ، و كم من شعبة رسمية تشعب وتوسع بها النمل بصورة مبالغ فيها حتى صار التعايش مع الشأن بالغ الصعوبة و لا مفر من وقفة حازمة . و طبعا فأن البيوت تكون صاحبة النصيب الأضخم من غزو الحشرات ؛ فالكثير من البيوت للأسف تشكو بأستمرار من وجود الصراصير و أيضاً أنتشار النمل إضافةً إلى حشرات الفراش المتغايرة كالبق و البراغيث و القراد و التى تتغذى على دم الأنسان مسببة له الكثير من اللدغات و التورم فى جسد . وتقدم مؤسسة الدولية جروب لـابادة الحشرات اقوى الوسائل لابادة فورية شاغرة من اى اثار جانبية تضر بصحة الموجودين فى المقر ؛ والتعامل مع جميع انواع الحشرات واستخدام الكيفية المناسبة لكل حشرة على حدة .